The GB series is the smallest of all our gas booster series. 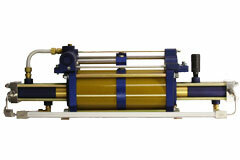 It is ideal for pressurizing small volumes or pressure testing small components. This series uses drive air pressure to increase the pressure of gases in a hydrocarbon-free high pressure section. The GB series is available in three pressure ratios: 15:1, 30:1 and 75:1. These boosters can boost pressures from as low as 50-psi up to nominal pressures of 7,500-psi. The output flow can be as high as 14-SCFM depending on the model and operating conditions. The gas boosters are used to boost the pressure of a variety of gases including argon, helium, nitrogen, oxygen and hydrogen. Some common uses of a booster or booster system are to scavenge bottled gases once the pressure has fallen below operational requirements, pressure testing vessels, laser cutting, aircraft support equipment and injection molding. The GB-D series is a single acting booster with a double head air drive section. It is suitable for boosting relatively low flows at medium pressure ranges. A double head air motor section allows the booster to reach considerably higher pressures than the GB series. The GB-D series is available in three pressure ratios: 15:1, 30:1 and 75:1. 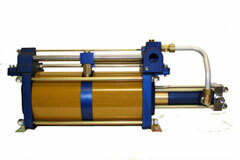 These boosters can boost pressures from as low as 50-psi up to nominal pressures of 15,000-psi. The output flow can be as high as 15-SCFM depending on the model and operating conditions. 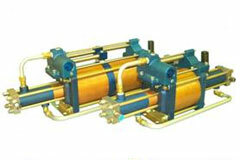 SC Hydraulic GBD series gas boosters double the output flow of the GB series. 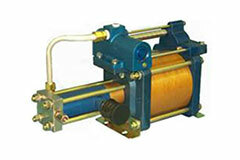 They are suitable for boosting relatively high flows at medium pressure ranges. This series reaches higher pressures than the GB series by using gas supply pressures to assist the air drive section in generating the total drive force of the booster. The GBD series is available in four pressure ratios: 5:1, 15:1, 30:1 and 75:1. These boosters can boost pressures from as low as 25-psi up to nominal pressures of 12,000-psi depending on the model. The output flow can be as high as 80-SCFM depending on the model and operating conditions. The GBD-D series combines a double acting high pressure section with a double head air drive section. 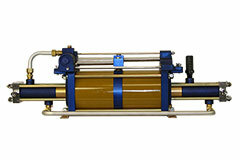 It is one of the most powerful series of all our gas boosters offering relatively high flow at high pressure. Similar to our GBD series, the GBD-D series uses the gas supply pressure to assist the air drive section in generating the total drive force of the booster. The GBD-D series is available in three pressure ratios: 15:1, 30:1 and 75:1. These boosters can boost pressures from as low as 50-psi up to nominal pressures of 21,000-psi. The output flow can be as high as 60-SCFM depending on the model and operating conditions. The GBT series is a double acting booster that uses two different compression ratio stages. A low compression ratio stage is connected to a higher compression ratio stage allowing this booster to achieve the highest pressure increment possible. These boosters are ideal for maximizing the use of low pressure gas supply bottles. This series is available in three different models each combining two stages of the following pressure ratios: 15:1, 30:1 and 75:1. These boosters can boost pressures from as low as 50-psi up to nominal pressures of 10,750-psi. The output flow can be as high as 14-SCFM depending on the model and operating conditions. 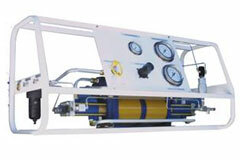 SC Hydraulic offers a variety of standard gas booster systems which integrate one or more of any of our gas booster models with gas filters, air and gas pressure gauges, air pressure regulator, air pilot switch valves, panel controls, tubular frame, etc. Systems are compact and ready to use. Our standard gas booster systems can be as compact as 21��x 21��x 38�� and are built in three main categories depending on maximum rated outlet pressure: 10,000-psi, 20,000-psi and 25,000-psi. We can also customize systems and design them to meet a particular set of specifications. Please contact SC Hydraulic or your local distributor for more information and further assistance on your application. The GBT-D series is a double acting booster that uses two different compression ratio stages in combination with a double head air drive section. A low compression ratio stage is connected to a higher compression ratio stage allowing this booster to achieve the highest pressure increment possible. A double head air drive section allows the booster to reach considerably higher pressures than the GBT series. The GBT-D series is available in three different models each combining two stages of the following pressure ratios: 15:1, 30:1 and 75:1. 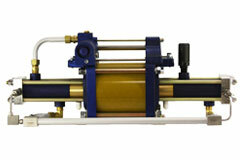 This series can boost pressures from as low as 50-psi up to nominal pressures of 21,250-psi. The output flow can be as high as 18-SCFM depending on the model and operating conditions.